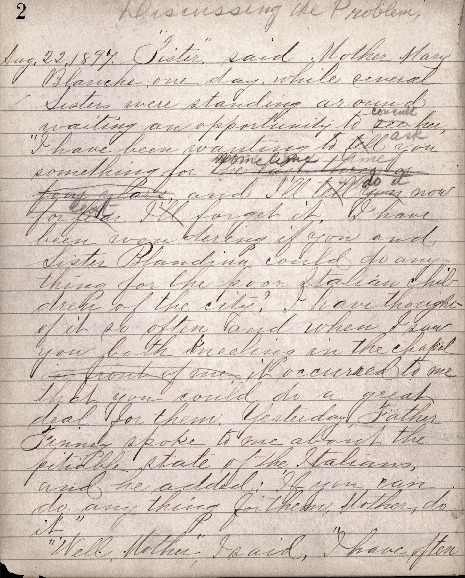 Document 7: Journal 1, 22 August 1897 and 1 September 1897, Santa Maria Institute Collection, Sisters of Charity Archives, Mount Saint Joseph, Ohio. From 1897 to 1929, Sister Justina Segale, a Cincinnati Sister of Charity, kept a journal of the activities of the Santa Maria Institute, a Catholic settlement she founded with her biological and religious sister, Blandina Segale. In 1897, the Sisters had recently returned to Sisters of Charity Motherhouse after thirty years of separate teaching assignments in Ohio, Michigan, and the Southwest. These early passages from the journal reveal the cooperation among various Catholic leaders and institutions in initiating and supporting the Santa Maria Institute. Mother Mary Blanche Davis, superior of the Cincinnati Sisters of Charity, Archbishop William Elder, priests in the Italian Sacred Heart church, the director of the Springer Institute [the Cathedral School of the Archdiocese], and Sisters of Charity teaching in a local parochial school all cooperated to assist Justina and Blandina in this endeavor. Cooperation resulted from the experience and expertise of the Catholic Church in social provision, but it was also necessitated by the overwhelming needs of a multicultural, immigrant church in an urban, industrializing environment and the threat of Protestant proselytizers seeking to woo Italian immigrants to their church and social services. August 22, 1897. "Sister," said Mother Mary Blanche one day while several sisters were standing around waiting for an opportunity to see her. "I have been wanting to tell you something for the last three or four years, and I'll tell you now for fear I'll forget it. I have been wondering if you and Sister Blandina could do anything for the poor Italians children of the city? I have thought of it so often and when I saw you both kneeling in the chapel in front of me, it occurred to me that you could do a great deal for them. Yesterday Father Finney spoke to me about the pitiable state of the Italians and he added: 'If you can do anything for them, Mother, do it.'" "Well, Mother," I said, "I have often thought of the same thing and that both sister and I would gladly undertake anything in their behalf, and that I too had intended to speak to you on that very subject." "Well," said Mother," that seems like an inspiration. Go, see the Most Rev. Archbishop and ask what he thinks about it.” After a few more remarks, Mother went to her room where many of the Sisters wished to speak to her, and nothing definite was agreed upon except to consult the Most Rev. Archbishop. The next day Sister Blandina and I called on the Most Rev. Archbishop but he was absent. Having telephoned this to Mother, she told us to call on Rev. Father Sotti pastor of the Sacred Heart Church, he too was absent, and the assistant pastor Rev. Joseph Quadranti informed us that the pastor had gone to New York and would not return for a week. We talked the matter over with Father Quadranti the assistant and to our surprise learned that the pastor had gone to New York for the purpose of consulting with superiors as to what could be done in this very matter. This was clearly providential. support if necessary. So it was decided to open a school for the Italian children. How this is to be done is but vaguely traced out, as we must consult the pastor before anything is undertaken. Mother has generously offered to assist and give the Sisters for the first year without any compensation. Sister Blandina and I will begin the work and board at one of the Sisters' houses, the one which will be most convenient for our work. Sept. 1, 1897. Preparing for work, Mother Mary Blanche, Sister Blandina and I came to the city yesterday to see what can be done for the opening of the Italian school. We first called on the Most Rev. Archbishop who takes a special interest in the undertaking. We met the Rev. Father Mackey who favored the project and expressed his ideas on the subject. He offered the basement of the Springer Institute for a temporary school. We next called at the Sacred Cuore [Sacred Heart] Church and learned that the Pastor Pedro Lotti had been transferred to a church in New Haven, Conn. and the Rev. Oreste Alussi is his successor here; Rev. Joseph Quadranti is assistant pastor. Both pastor and assistant pastor are delighted with the project. Mother Mary Blanche decided that we make our temporary home with our Sisters at the St. Xavier Parochial School residence. In the mean time, we shall study the situation and await developments. In the afternoon we visited Mrs. John Severoni as she is one of the most prominent ladies of the congregation and takes part in its good works. From her we learned that the kindergarten and school established by the Methodists are drawing many of our Italians away from the Church. Mrs. Severoni will help us in anything that we shall undertake for the Italian School. Everything looks encouraging.